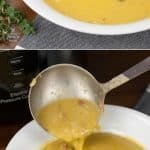 Pressure Cooker Split Pea Soup is incredibly easy and can transform frozen smoked ham hocks and dried split peas into an amazing soup in just 40 minutes! 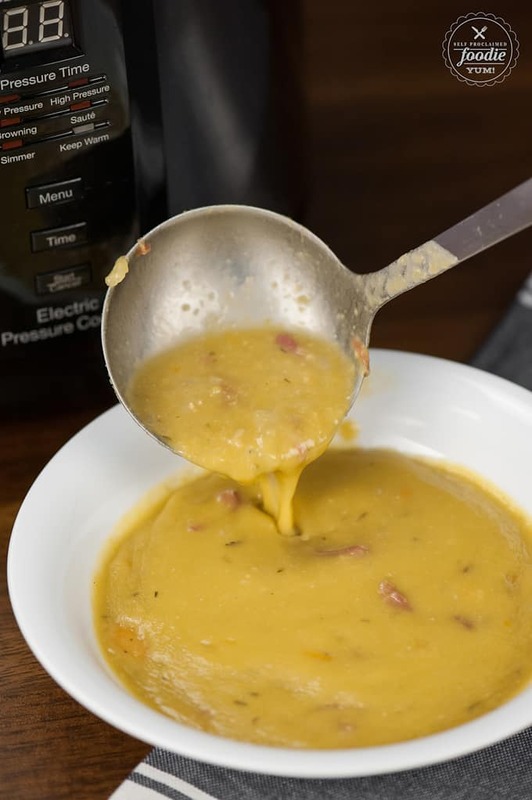 Making homemade split pea soup with ham is so easy when you use your Instant Pot. The ham bone gives this easy soup all the flavor you need. Serve it up with an amazing grilled cheese sandwich and you have all the taste and comfort you desire on a cold day! Do you have an electric pressure cooker yet? They’re all the rage now. I got mine several years ago (I have two, actually) and was super scared and intimidated to try using it. First of all, the thought of high pressure scares me. I kept envisioning the lid blowing up during the cooking process. 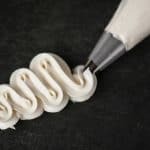 I consider pressure cooking very similar to canning – people have been doing it for years and it’s a tried and true method of preparing food. Now I can’t imagine not having an Instant Pot! I’ve made split pea soup countless times on the stove top. Never has it been as delicious or as easy to prepare as when I make it in the pressure cooker. I have made it exactly the same way three times now using this recipe and it turns out perfectly. How long does it take to make split pea soup in the Instant Pot? The total cooking time for this soup is 40 minutes under high pressure – 30 minutes to cook the frozen ham hocks and another 10 with the added peas and veggies. Less time if the ham you are using isn’t frozen. Keep in mind that it still takes time for the cooker to come up to pressure, so factor that into your timing. That being said, it takes hours for peas to soften on the stove the regular way, so the pressure cooker is definitely the way to go! What seasonings and ingredients are used for split pea soup? The only thing I season my split pea and ham soup with before serving is freshly ground pepper. The salt and incredible flavor come from the ham hocks and that is all the flavoring you really need when making homemade split pea soup. To make homemade split pea and ham salt in the Instant Pot, you will also need dried split peas, a dice onion, diced and peeled carrots, diced celery ribs, and dried thyme. First, place your frozen ham hocks in you pressure cooker and cover them with ten cups of water. Seal the lid of the pressure cooker and bring it to high pressure before cooking the ham hocks for 30 minutes. After that, quick release the pressure to open the lid and remove the ham hocks. You will then place your ham hocks on a cutting board to let them cool. 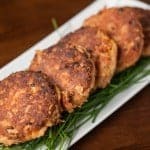 While your ham hocks are cooling, add your split peas, onions, carrot, celery, and thyme to the liquid leftover in the Instant Pot. Bring your pressure cooker back up to high pressure and cook at high pressure for 10 minutes. While your split peas are cooking, you can shred the meat from your ham hocks and discard and bones and fat. Once the split peas are done in the pressure cooker, the split pea soup will appear thin. However, once you stir your soup well, the split peas will dissolve, and the soup will thicken. 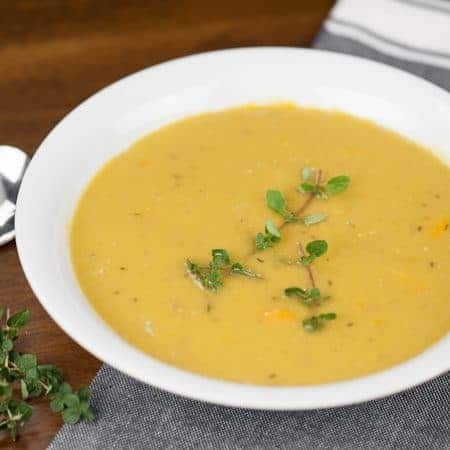 If you want your soup to be thicker, you can just mash up your ingredients with a potato masher or process half of the soup through a blender on low speed before recombining it back with the rest of your split pea soup. Before you serve your healthy split pea soup, add the shredded pork back into it. Enjoy! 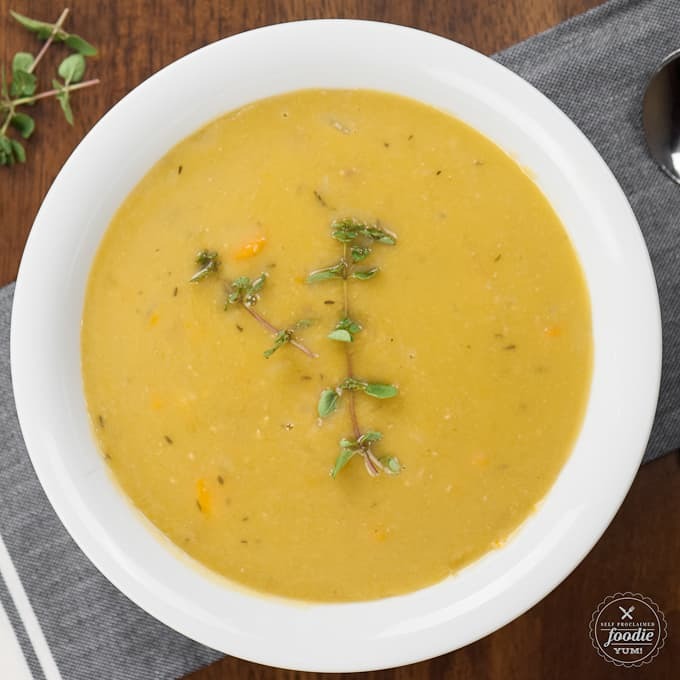 Homemade split pea soup is typically good for around 3-4 days in the refrigerator. Make sure to store your split pea soup in a covered container for optimal freshness. 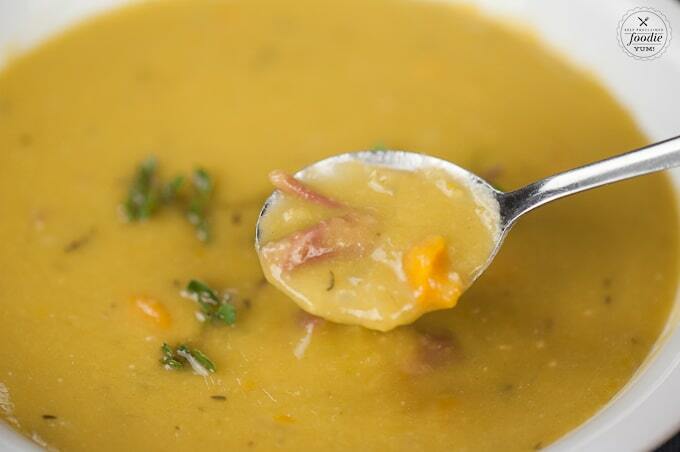 In fact, this split pea and ham soup is the perfect meal to have leftovers for taking to work the next day! To freeze homemade split pea soup, simply refrigerate first and then add soup to reusable quart sized containers and freeze. There are a couple of reasons why I prefer the pressure cooker as opposed to the cook top for this recipe. First, the flavor is amazing. 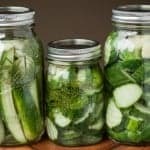 By cooking under pressure, you’re preserving all of the flavor and vitamins in your food and it just tastes a million times better than when you cook it on the stove or in the crock pot. 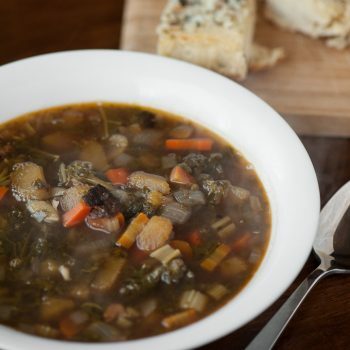 Sorry slow cooker fans – the pressure cooker wins when it comes to a soup like this. Second reason is the consistency. When you cook soup in a pot or in a slow cooker, you lose a lot of your liquid to evaporation. Not with the pressure cooker. You have so much more control. Split pea soup that is too thick or too thin is just gross. Perfect consistency is key. 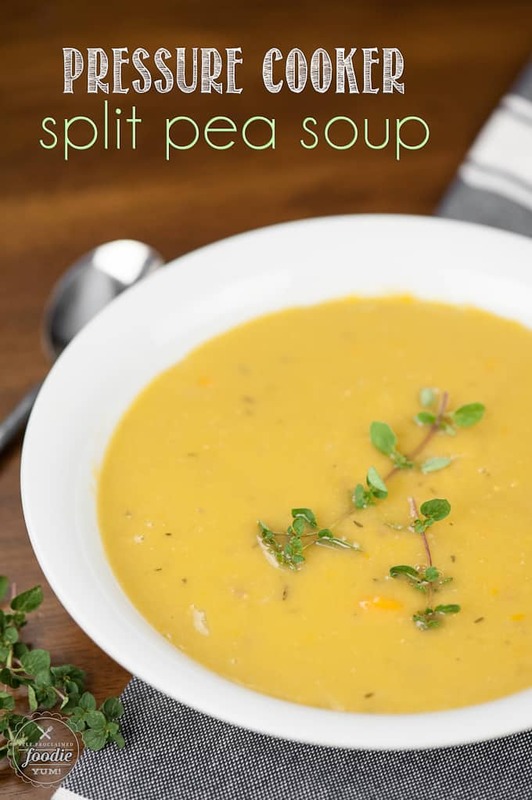 This quick and easy homemade split pea soup recipe is incredibly delicious. 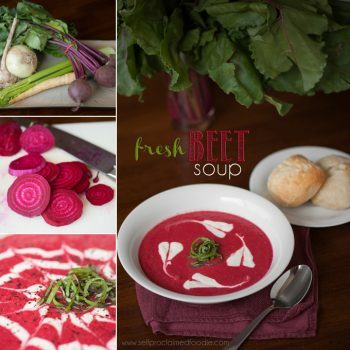 I love making soups like this for a healthy family dinner that can be enjoyed any day of the week! Can I use leftover ham instead of ham hocks to make split pea soup? You bet. One of the best uses for a leftover ham is homemade split pea soup. In fact, I have half of a spiral cut ham in our freezer right now that I plan on turning into split pea soup. The best kind of ham to use is bone-in. When you’re making stock, soups and stews, the bones always add the most flavor. But, if your leftover ham is boneless, it will still work. In 40 minutes, your electric pressure cooker can transform frozen smoked ham hocks and dried split peas into the most delicious ad healthy Split Pea Soup. 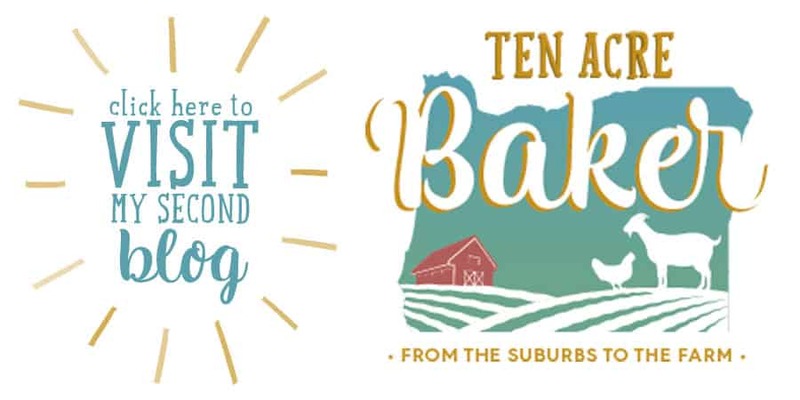 This post first appeared over at Real Housemoms where I was a contributor. 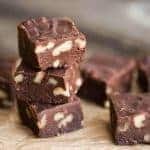 This recipe originally appeared on my blog in September 2016 and has since been updated with more information and cooking tips for your reading pleasure!